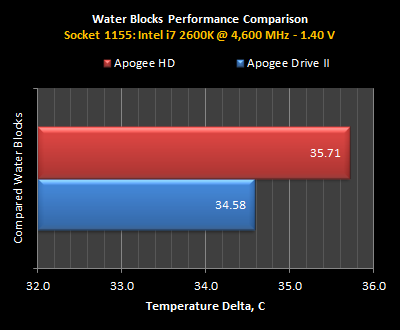 Best thermal performance: the Apogee™ Drive II manages to achieve better thermal performance than the award-winning Apogee™ HD. 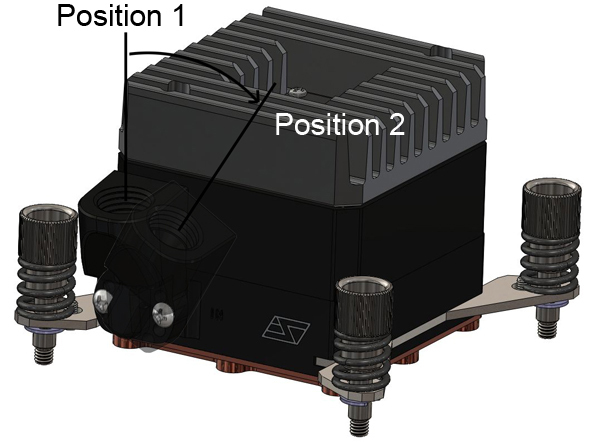 Best hydraulic performance: thanks to the integrated, PWM controlled MCP35X pump, which has established itself as the best-in-class pump on the market, the Apogee™ Drive II is the world's only waterblock that can be considered as a flow enhancing device, as opposed to a flow-robbing device. Best retention mechanism: proven time and again to satisfy beginners and hard-core enthusiasts alike for its ease of use, reliability, and repeatable results. 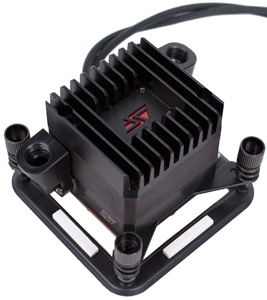 Compact form factor enables liquid cooling in space constrained applications. Adjustable G1/4 inlet and outlet ports, compatible with all compression fittings. Illuminated logo in 3 colors: Red, Blue, or green. 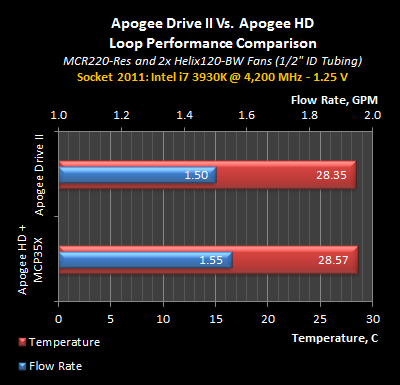 World's best thermal performance based on our comparative testing, when added to a conventional liquid cooling system including pump, radiator, and reservoir, the Apogee™ Drive II yielded up to 1.2ºC better thermal performance than the Apogee™ HD (Intel i7 2600K socket 1155) - When installed in a system by itself, including only a radiator and a reservoir, the Apogee™ Drive II edged the HD by 0.2ºC (Intel i7 2600K socket 1155). With the top 5 water-blocks in the world being within a couple of degrees from each other, the next differentiating factor to many enthusiast users is flow restriction. 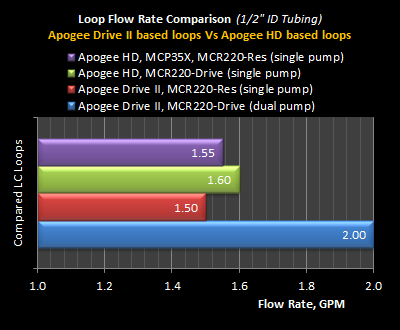 Given that the Apogee™ Drive II has an integrated pump - one that features the highest flow rate in the useable range, it doesn't restrict flow at all -on the contrary, it enhances it! 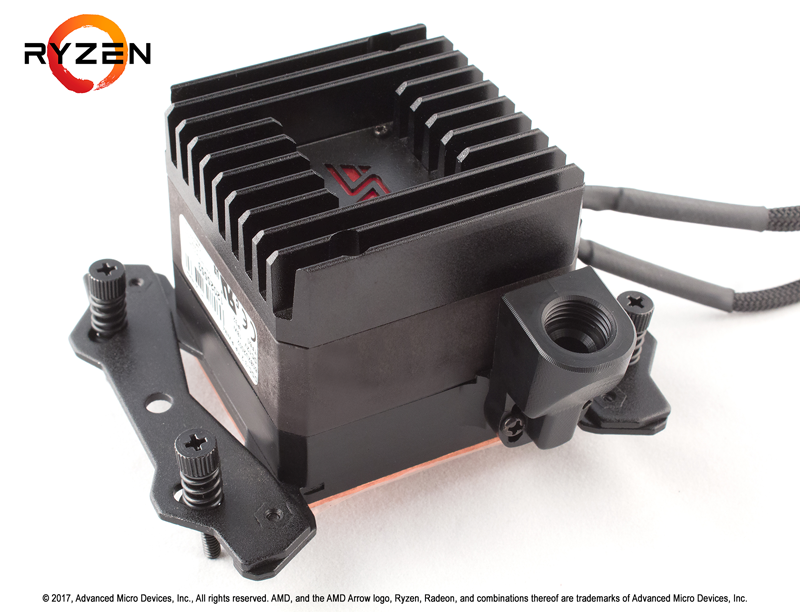 Even if we consider that adding a second pump to a liquid cooling system yields relatively marginal thermal improvements, the redundancy offered by a second pump is a priceless safety feature that can save your expensive components from fatal overheat in case of a pump failure. Thanks to the PWM function of the integrated MCP35X pump, the Apogee™ Drive II pump speed - and operating noise, can be adjusted from 1300 RPM all the way to 4500 RPM. 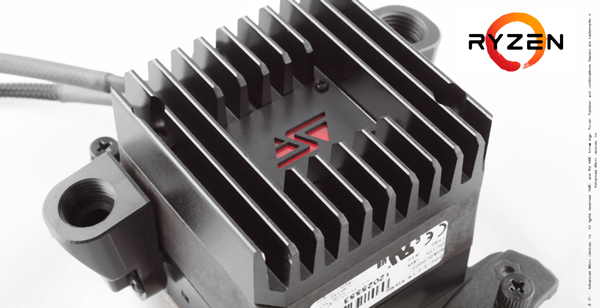 When two pumps are running in tandem in a liquid cooling system, it is not necessary that their speed be identical. So your Apogee Drive can either be pushing massive flow at 4500 RPM, or simply humming along in the background at a completely silent 1300 RPMs. Either way, it will never slow down your flow, but always increase it. Another great benefit of the BIOS controlled PWM is that the pump speed can be tied to the CPU temperature and increase or slow-down depending on CPU load. The pump could be running at minimum speed when the processor is at iddle, and speed-up when the CPU temperature reaches a set temperature. 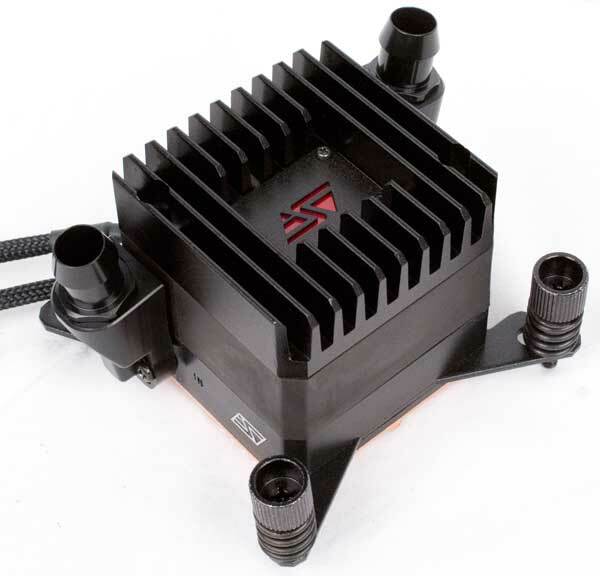 Have you ever tried to fit a conventional liquid cooling system in a small form factor computer? The Apogee™ Drive II makes this challenge a great bit easier by consolidating 2 best-in-class performing devices into one. 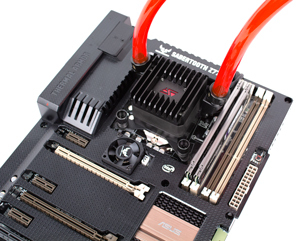 Swiftech's retention mechanism is widely recognized as the simplest and safest to use. It has been further enhanced with added attention to details and quality, such as hollowed thumb screws, and improved back-plate fabrication. Version 1155/1366: for Intel® processors using Socket LGA 775, 1155/56 and 1366: back-plates for 1155 and 1366 are included and socket 1155 back-plate is installed by default; the back-plate for socket 775 is not included and mailed to users free-of-charge. 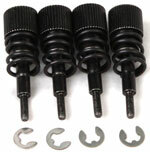 Separate kits are also available for the above 3 groups of sockets for upgrade purposes. 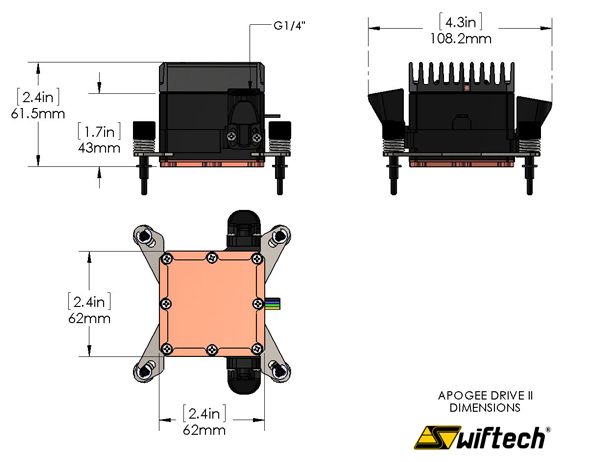 The Apogee™ HD ships with Swiftech's TIM-Mate™ thermal compound highly rated for its excellent thermal performance and ease of application. When considering the cost of purchasing an MCP35X pump ($99.95)+ an Apogee™ HD ($74.95), the total cost at MSRP is $175; compare this to the $140 MSRP of the Apogee™ Drive II (average of three models), this is a $35 or 20% saving. The following graphs reports the data collected from testing performed with actual retail processors under 100% load using CPU Burn. Published results are the best of a minimum of 5 mounts. 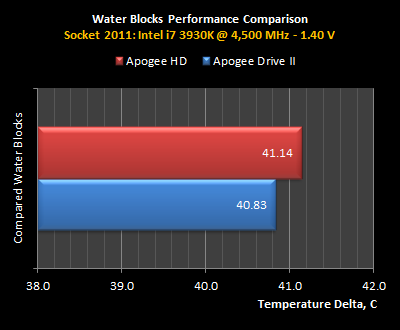 These results are indicative of our test bench settings and of the tested processors only. Results may vary from one processor to another. Note: "Temperature Delta" means the difference between the average CPU core temperature and the average air temperature. This reporting method reflects the true efficiency of the cooling system because it eliminates ambient air temperature variations in the data being compared. Users are cautioned that the above data is provided for reference only, and is not directly comparable with CPU temperature values collected a) from an enclosed chassis and b) without deducting ambient air data. 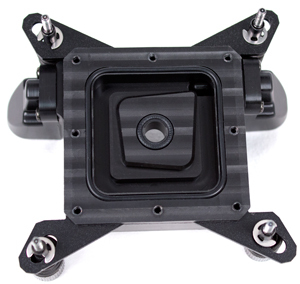 The water-block housing is precision-machined from black polyacetal copolymer (POM). 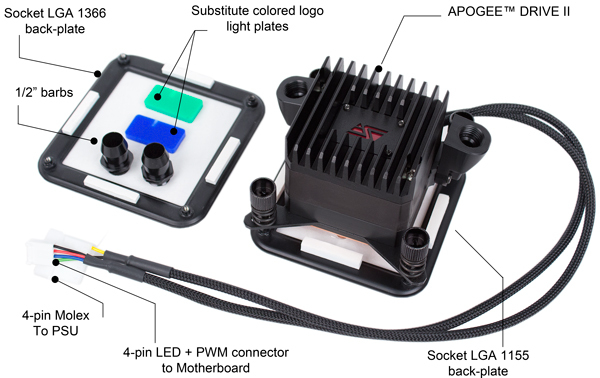 A separate black anodized aluminum heatsink is included to provide additional cooling to the pump; the heatsink alse serves as a receptacle for the LED and colored acrylic inserts included in 3 colors: red (installed by default), blue and green. 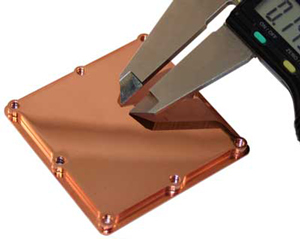 The base-plate is precision-machined from C110 copper. 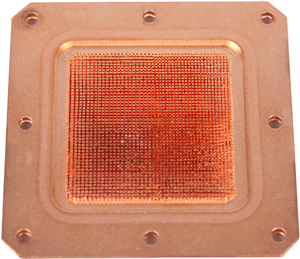 Thermal design of the cooling engine is characterized by Swiftech's fin/pin matrix composed of 225 µm (0.009") micro structures. From default (vertical), the inlet and outlet ports can be tilted to an angle in order for example to facilitate tube routing in space constrained applications. Version 1155/1366: Compatible with Intel® Core™ desktop processors: sockets LGA775, 1155/56, 1366, and 2011. The motherboard back-plate for socket 1155 is installed by default, and a back-plate for socket 1366 is included. 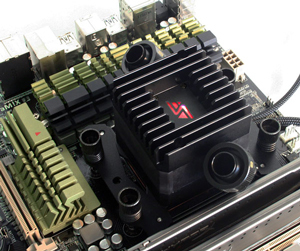 The socket 775 motherboard back-plate is not included with the block and is mailed to users free of charge upon request. The Apogee™ Drive II ships pre-installed with black 1/2" barb fittings; 3/8" barb fittings are also available in option. Port threads are G1/4" compatible. Very nice finish on the water block, While the pump works great after only a few months the light on the pump failed. Guess I'll just live with it as even if you read on their forum RMA's take very long!! I already dealt with this on the PWM and when I finally received a replacement it was the same model as was supposed to be replaced, not the newer redesigned one go figure!! I gave up and plugged everything into the MB. I just wanted to add this review to laude the performance of this pump. I built a closed geothermal loop to cool my rig. It consists of 40' of copper tubing built into a 10' long manifold and 90' of PEX tubing. I'm running the Apogee Drive II, 2 GPU blocks, a NB block, a SB block, a VREG block, and a memory block. Still pumping 1 GPM of water. Woohoo! This thing rocks. I have been using one of these since March of 2013 and it has been run almost round the clock. This little pump keeps everything cool. I have it on a custom loop cooling a I7 3930 and a GTX Titan GPU using 1/2 inch tubing and XSPC reservoir and a double thick radiator with push/pull fans. It works great even with both the CPU and GPU overclocked and gaming. Tuff little pump! This is an EXCELLENT PRODUCT! I am going to purchase another one for a back up. The best pump in the market combined with one of the best blocks. A beast. As with all Swiftech products this thing is all about quality. The mounting hardware is excellent, block is one of the best and the pump is pretty much noiseless. Cooling FX 8320@5Ghz, R9 290X and pushing trough four MCR-H220 radiators without sweating. Couldn't be happier with my purchase.